I'm a big fan of Green People products, but up until now, hadn't tried any of their hair care. I have slightly dry hair that's mostly caused by over straightening it, so this duo sounded perfect for me. 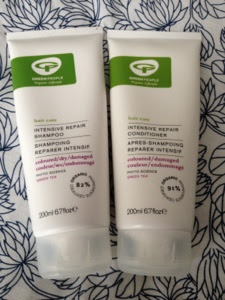 The Intensive Repair Shampoo* and Conditioner* are part of a small range of hair products from Green People, which are designed to naturally strengthen damaged hair and help moisturise dry hair. Like all Green People products, the shampoo and conditioner are organic and based on natural ingredients. The shampoo contains no SLS (the bubbling ingredient in soap), so is really gentle on hair, but also gives a good foaming action. It can be a bit weird when you switch to SLS-free shampoo as you don't get as many bubbles, but after a while you don't really notice it as much. This leaves my hair feeling really clean, and has a soft, citrusy smell to it. I also find that I don't need to wash my hair as often, so instead of every day, I can go 2 to 3 days before it starts looking greasy. The conditioner is surprisingly light given the fact this is marketed as an intensive repair product. I've found it works well for me as my hair is quite fine, despite being dry, but for thicker hairs and for those that are colour damaged, I'm not sure if this would offer enough moisture for you. That said, it doesn't weigh my hair down and still keeps it looking shiny, so I'm pretty pleased with it. The shampoo and conditioner are £10.95 each, which is a little pricey. 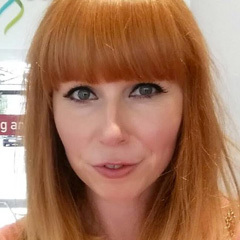 I think I would definitely repurchase the shampoo again, but I would like to find a slightly stronger conditioner for the summer as the heat dries my hair out even more. Have you tried any Green People Hair products? I have not tried their hair range and I am not sure these would be good for me since although my hair is thinning, each strand is actually quite thick if that makes sense! That's seems great. btw, do you accept for guest posting? I can provide you a great article about hair related.